TripAdvisor is delighted to recognize Kims Mini Meals with a 2013 Certificate of Excellence. This prestigious award, which places you in the top-performing 10% of all businesses worldwide on TripAdvisor, is given to businesses that consistently earn high ratings from TripAdvisor travelers. Congratulations! You've earned a 'Recommended on TripAdvisor' sticker! and it shows in their reviews. by presenting you with a coveted 'Recommended on TripAdvisor' sticker. We hope you'll display your sticker with pride for customers to see. Congratulations again on your recognition and keep up the good work! Aberdeen Angus Beef comes from Angus Cattle originally bred in Scotland and is famous worldwide. Aberdeen Angus Cattle are now bred in other parts of the world but from original Scottish stock. with Black being the most popular breed over there. rom a selection of the hornless cattle which were known in those days as Angus Doddies. the pair were responsible for producing many stock lines which still continue today. ensure top-quality beef for the most delicious steaks possible. to ensure an all natural diet which adds to the nutritional value and flavour of the meat. and tender when cooked and the fat content and calorie content will be lower than in other meats. to know that the result is going to be a tasty, juicy, top quality steak. while Brisket, Chine or Chuck will be ideal for pie fillings, casseroles, soups and stews. and Beef will provide the most succulent, delicious and nutritious meat possible. and Aberdeen Angus is by far the cream of the crop. The words Aberdeen Angus Beef have become synonymous the world over with Top Quality Beef. Locals around Edinburgh say you have one of the best spots around. you had 10 Yelp reviews and an average rating of 5 stars out of 5. We think that's pretty impressive. window cling in recognition of being such a well-loved local favourite. you are Yelp approved and a business worth checking out! and search for 'Kim's Mini Meals' in 'Edinburgh'. and let's face it, you're curious. LACY curtains, photographs of Korean food, a ceramic clog and chintzy bone china crockery. Been to Kim’s Mini Meals? Then you’ll understand what I’m talking about. If you haven’t, then prepare to enter a BYOB eatery that describes itself as “elegant and comfy, just like home”. That’s accurate, if your residence features a decor that could be described as Barbara Cartland meets couthy tea room via a Red Cross shop. It’s eccentric, but very loveable. I took a seat, which was made of green velour and studded with sparkly glass buttons. The eponymous owners, the Kims (for this is a proper family business), were all visible – mum in and out of the kitchen, and father and son front of house. “Do you like classical music?” Dad asked, when Beethoven came on the stereo. I nodded obediently, as two gratis bowls of mushroom soup landed on the table, for me and my dining partner Mercy. Standard, as funghi broths go. However, the kimbap (£5) which came next, was great. There were 11 of these laver-wrapped parcels of nutty and glutinous black rice, the latter of which was an inky purple shade and dotted with sesame seeds. In the centre of each generous whorl – like a cross-section of a mineral – was some neatly-packed crab stick, a sliver of pastel-coloured omelette, folded ham, grated carrot and kimchi. Our other starter – the gamja jeon (£7), served on a flowery Portmerion plate, was, essentially, a springy omelette, containing grated potato, flecks of shiitake mushroom, struts of spring onion and just a little nip of chilli. On the side was a sweetened soy sauce for dipping. A homely offering. To be honest, these options would be enough for a decent lunch, but we wanted a proper tour of the menu. Mr Kim, aka Dad, came over to help us with our main courses. Mercy’s vibrant-looking dolsot bibimbap (£7) was hissing away in its hot stone bowl, with ingredients including grated carrot, kimchi, courgette strips, sliced mushrooms, mince, white rice, a large blob of gochujang (spicy red pepper sauce) and a raw egg. Pops grabbed the chopsticks and stirred the lot, until the latter was crisp and everything was cross-pollinated to perfection. My dining partner, who has a Korean sister-in-law and, thus, is experienced in the ways of the traditional bibimbap, liked this dish 110 per cent (as they say on Britain’s Got Talent). “Where is your spoon?” said Mr Kim, before demonstrating how I should tackle my pork bulgogi (£7). First, a shred of lettuce, then a layer of a yoghurty pineapple purée, then a piece of thinly sliced pork, which was clad in a spicy gochujang sauce, with chopped veg and a sprinkling of sesame seeds. On the top of this spoonful – a clod of the violet rice. Down the hatch (he didn’t, thankfully, stay to make sure I ate all my dinner). Lovely: hot and sweet, spicy and nutty, proper soul food. These dishes were washed down with some electrifyingly sugary Korean juice - one glass of crushed pear (£1.50) and a medicinal-tasting cinnamon drink (£1.50). We didn’t really need pudding, but we thought we’d give it a whirl. At lunchtime, we were told that there was a choice of “coffee or custard cake”. We ordered one of each, and both of us received the same vaguely coffee-ish hostess cake, with a cream filling. Considering they only charged us £1.50 each, mustn’t grumble. Anyway, this place is all about the savouries and spices. 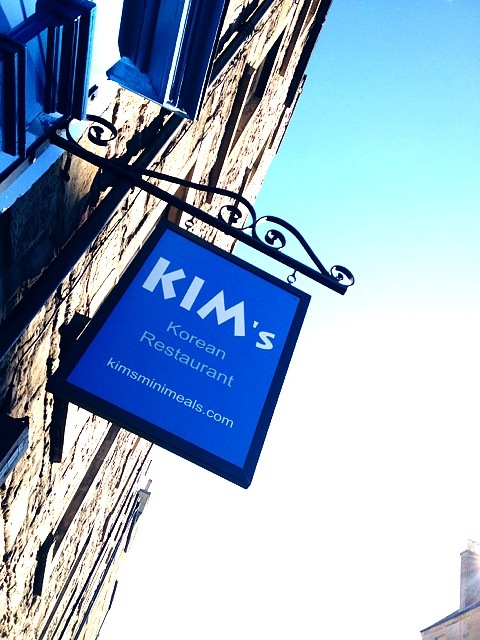 On the website, they, rather humbly, describe themselves as “one of the best Korean restaurants in Edinburgh”. Considering there are only about three in the entire country, I think they could consider themselves one of the best in Scotland. If not (taking the prices and generous portions into consideration) THE very best. After all, this is a gem of a place, with lots of personality, which is probably why it was heaving on our weekday lunchtime visit. Because of this, they don’t take reservations, so be prepared to turn up and try your luck. Tonight ten of the Total Food Geeks (and one honorary member and fellow foodie, Alaster) delivered into the wonder-filled world of Kim's korean restaurant, Edinburgh Old Town, for our January themed Good Things in Small Packages' dinner. We’re sure that there will be lots more discussion surrounding this wonderful restaurant both on and off the TFGE site, but for now, on behalf of the whole TFGE group, we wanted to say our most sincere thanks to Mr and Mrs Kim and their team for a truly perfect evening. Your strapline “Elegant and Comfy, Just Like Home” is just a hint at the precious experience in store for those that visit you. Thank you Kim’s Mini Meals! Traditional Kimchi is a spicy, fermented condiment. This staple Korean food is made from cabbage, garlic, salt and other seasonings and vinegar and fermented for 3-4 months. The long fermentation allows the probiotics to grow and multiply, and the nutrients in the vegetables to be “pre-digested” and made more bio-available. There are 187 historic and current varieties of kimchi. Kimchi is Korea’s best known food, the pride of Korea – a cultural icon and national treasure. It is served at almost every meal. The average consumption of kimchi is around 40 kilos per person per year. Recognized as one of the world’s healthiest foods, kimchi is loaded with key vitamins, kimchi contains healthy bacteria that aid digestion, plus it is low calorie and high fibre. It is more than just a spicy food. It is renowned for its restorative and rejuvenation properties and it scientifically proven to eliminate unfriendly bacteria and boost immunity. In 2003 an outbreak of what became known as SARS occurred in Asia, while other countries were badly affected, Korea was virtually untouched. Also, the Korean chickens infected with the H5N1 (avian flu) virus, recovered after eating food which contained the same good bacteria found in kimchi. Subsequent studies (on 200 chickens) by Korea Food Research Institute supported the theory that it enhanced immunity. In fact several studies have shown that kimchi probiotics protect against even the worst viruses and bacteria. The “good” bacteria in kimchi produce bacteriocins – which are harmless to the body and the rest of your “good” bacteria, but are toxic to the “bad” bacteria. (or aggregated lymphoid nodules which form a part of the body’s immune system) – inside your gut. Enhancing your immune system is crucial to your well being. The single biggest risk factor for deadly infection or disease is a weakened immune system. Research (Kor J. Microbiol, Biotechnol (2008) 36(2), 106-114) also shows that kimchi probiotics fights ulcer-causing Helicobacter pylori bacteria. Further, kimchi produces beneficial SCFA’s (short chain fatty acids) which are reported to inhibit the development of invasive colon cancers. This is supported by numerous clinical findings, including some published in the Journal of Nutrition (2001: 131:3041S-3046S, and 2002: 132, 1012-1017). Kimchi is so highly regarded in Korea that price increases in 2010, which followed poor weather conditions for harvesting the cabbage, were considered a national tragedy. However, you don’t have to worry about eating 40 kilos of kimchi each year or the price! The easy way to benefit from the goodness of kimchi is to consume easy to take concentrated kimchi extract. providing the positive synergistic effects for killing “bad” bacteria and enhancing immunity. It’s more than just probiotics! Oriyen Korean Kimchi Concentrate Powder combines the goodness of natural nutrients in fermented kimchi with the health-promoting benefits of kimchi probiotics. Probiotics like kimchi help support weight management…promote a healthy gut…maintain vim and vigor…and aid in the reduction of yeast growth. What are probiotics – and why do you need them? This healthy bacteria helps support and maintain the necessary balance with unhealthy bacteria in the intestines. Probiotics are consumed in fermented foods or dietary supplements with active live cultures. Lactic acid bacteria (LAB) and bifidobacteria are the most common microbes used in probiotics. When you take antibiotics, you’re killing the “good” bacteria along with the “bad”. The human body needs billions of probiotic bacteria to function effectively, and ideally we have large stores of them. Oriyen Korean Kimchi Concentrated Powder gives you the nutritional equivalent of over FOUR POUNDS of fermented kimchi – all in a single sachet. That’s a powerful little pack of nutrition! One serving = the goodness of over 4Ibs of fermented kimchi. Plus, it’s so quick and easy. No refrigeration is needed for this handy sachet. Just pour it into your mouth. No muss, no fuss. We take care, not only of the content, but the container. The plates we use for the meals are famous bone china, from Royal Doulton to Wedge Wood and others. We believe that the presentation of the food is as important as the taste in your experience at Kim's Mini Meals. So...in case you haven't heard, here's what's happening at Kim's Mini Meals these days..
After a bit of a wait, we now happily offer and serve 'Dol Sot Bibimbap' ! For those of you not familiar with the term, it means stone bowl Bibimbap, or in other words- loads of veggie goodness, rice and spicy sauce (and mince for those who can't resist the beef! ), sizzling in a stone bowl brought to you directly from Korea (the bowl, that is!) ;) Having doubts about it? Come and see/try for yourself! The crispy rice at the bottom of the bowl will have you asking for more...or perhaps that would be the gochujang (spicy red pepper paste). At any rate, the chef is happily buzzing around the kitchen with loads of ways to delight the hungry peeps out there! In other news- you never know who will come around, so if you've stopped by at lunchtime or dinner, and we've not been able to get you a seat, our apologies! We do try our best to make sure everyone leaves happy and full! To make sure that you don't get turned down, you can always give us a call and reserve a table for lunch or dinner! We'd be more than happy to save you a spot if you let us know ahead of time! Byung-Sun Lee and his friend Hak-Woon Kim have been working tirelessly to promote Jasmine Gwangju. Kim is not a student. He is a missionary and entrepreneur. Before arriving in Scotland, ten years ago, he was in France and Bulgaria. In Edinburgh, he was horrified that Korean tourists, if they came to Scotland at all, arrived on the overnight bus from London, went round the castle and the Royal Mile, then left. His travel company now brings 3,000 Koreans a year to Scotland. "Most of them," he says proudly, "stay for three days." Kim and his wife also run Kim's Mini Meals, on Buccleuch Street. Like Jasmine Gwangju, the restaurant is another way of helping Korea to catch up with better-known Asian cultures. "We want to introduce Korean food. Here it's like mother's cooking, we don't use MSG, it's like the food a family makes for children. Or guests, or VIPs." In fact, there are three Korean restaurants in Edinburgh, one in Aberdeen and one in Glasgow. The specialist ingredients, oils and tongue-blistering chilli sauces are now easily available in Chinese supermarkets.